"We look at the world and see what we have learned to believe is there. We have been conditioned to expect.. but, as photographers, we must learn to relax our beliefs." Aaron Siskind's early work as a social documentary photographer is best seen in his contributions to the Harlem Document (1932-40), a survey of life in Harlem. 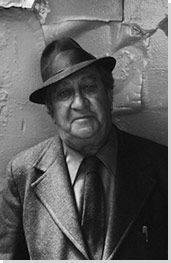 Siskind also identified with the ideas and styles of the Abstract Expressionist artists in New York in the 1940s. In these later photographs he continued to emphasize the modernist concern with the flatness of the picture plane, but intensified his approach to picture making - with close-up framing, as well as emphasis on texture, line, and visual rhymes - creating abstract images of the real world. Siskind turned the medium of photography on its head, taking pictures of found objects that were simultaneously true-to-life and abstract; he was one of the first photographers to combine what was known as "straight" photography (recording the real world as the lens "sees" it) with abstraction. Siskind found emotional joy and tension in the process of discovering subjects and photographing them in such a way as to emphasize his reading of the world as essentially abstract, a series of echoing forms, lines, and textures. Like the Abstract Expressionists, with whom he was friends, Siskind turned away from the social/political world post-World War II, and instead looked inward to seek meaning in the mostly inanimate forms he observed around him. Interactive chart with Aaron Siskind's main influences, and the people and ideas that the artist influenced in turn.